After Waxing Oil with all Natural Tea Tree Oil View. 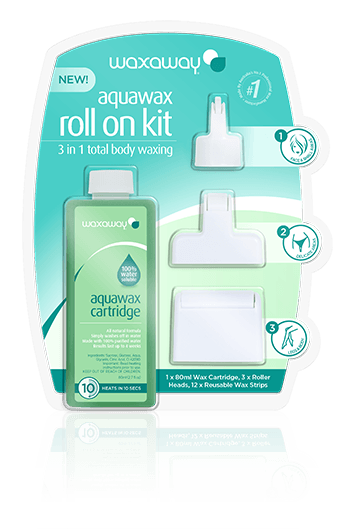 Waxaway Aquawax Roll On Kit includes everything needed to achieve salon smoothness at home. With an easy roll-on application and no spatulas or electrical wax heaters required; simply heat, roll and wax! There is no sticky residue as Aquawax is 100% water soluble, it simply washes off in water. The three unique roller heads suit all areas, making it easy and convenient to achieve results that last up to four weeks! Achieve salon results in the comfort of your own home with Waxaway, the only brand of wax made by professionals using advanced salon formulas and technology. Hold skin taught with one hand and gripping on to the edge of the wax strip, quickly pull back in the opposite direction of hair growth as close to the skin as possible.